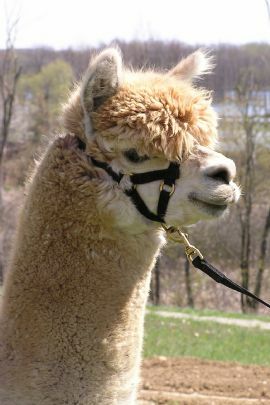 Alpacas - "What a Wonderful Life"
He has won many awards across North America and here are last year's show results for a few of his offspring: International Odyssey - Juv. Brown 1st Place. All American Futurity - Juv. Fawn Male 1st Place. AOBA National Conference - Yearling Fawn Male 1st Place. The Babe is in a league of his own! One of the few Full Accoyo Dark Med Fawns in the Country. When people get their hands on him, they comment about how is fleece is like getting lost in a bowl of butter. It is thick, rich and smooth. We have the results of The Babe's first pairing. We bred him to a beautiful girl who has solid conformation and good staple, yet she needed crimp, density, coverage and top knot. That is a big order, but we were confident that The Babe could pull it off. She was born fall of 2004 and what a beauty! 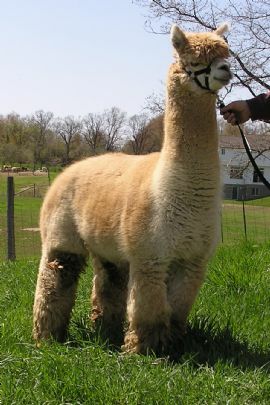 Her name is Camille and at just 6 months old competed at the MOPACA show. Not only did she stand proudly at the top of her class, she went on to take the Color Champion for the light class. That was a win out of 35 animals! The Babe also has an amazing Silver Gray boy on the ground named Tamerlane (see link below). 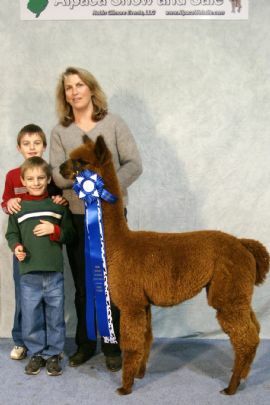 This young male just took the Blue Ribbon at the Maryland Show - Spring 2006. These ones are a little young to show just yet -- but come fall of 2006, they will be crashing the gates of the big shows. They are Ellie May and RosaCoyo. Be sure to check them out on their own pages. Breedings are limited, so reserve yours today. 1st Place - National AOBA Handcrafter's Spin-Off 2003 - The Babe scored 84 out of 85 points! For qualified buyers, we have both flexible and creative financing available.